In a contest, naturally skewed towards batsmen, given the presence of shorter boundaries, power-plays and a natural urgency of batsmen (and their propensity to score), it’s exciting that a number of bowlers stood out in the IPL. In IPL 2018, there might have been stalwarts with the bat- Kane Williamson, Risabh Pant, KL Rahul and co.- who constructed skyscrapers with sheer amassment of runs, but a lot of attention went toward bowlers who made runs hard to come by. And above all, challenged the might of the willows and decided to put on an act together. Interestingly, of the top 5 bowlers in the eleventh season of the IPL weren’t all Indian bowlers. And with emphatic talent from different parts of the world, the efforts of these bowlers truly heightened the expectations one had of the IPL. The last time he participated in the IPL, Tye took a hat-trick. That too in his debut game. By the end of the IPL 2018 season, he had bagged the purple cap, something, that quite frankly, seemed his ever since Andrew Tye clinched an excellent 4-for against Rajasthan Royals in the middle of the tournament. There weren’t many bowling stars from the King’s XI camp apart from Ashwin, but in Andrew Tye, they found a superstar who used his height to good effect. Collecting 24 wickets, the most from the IPL, Tye captured a 4-for on three separate occasions. There was no bowler in the IPL this season, who could match this feat. An earnest and bright talent who believes in quietly going about his job and returning back to the popping crease for the next ball, Tye’s ability to succeed lay in his skill, to bowl fuller without consuming a lot of runs and of course, the knuckleball. If you pressed the rewind button on international cricket by 2-3 seasons, you’d have found that the title of the mystery spinner belonged to Sunil Narine. Perhaps, for the pure difficulty in hammering him out of the attack, the tag may now belong to Rashid Khan of Sunrisers Hyderabad. Khan shot to a fervent cricket-loving public here in India, when his wrong one cleaned up MS Dhoni as it kissed the inside of the CSK captain’s bat, Dhoni failing to read the ball. Later, Virat Kohli found his stumps disturbed and wide grin on Khan’s face. But it would be his 3-19 against King’s XI where he made irrecoverable cracks in Rahul’s sides’ top order that marked his true IPL moment. 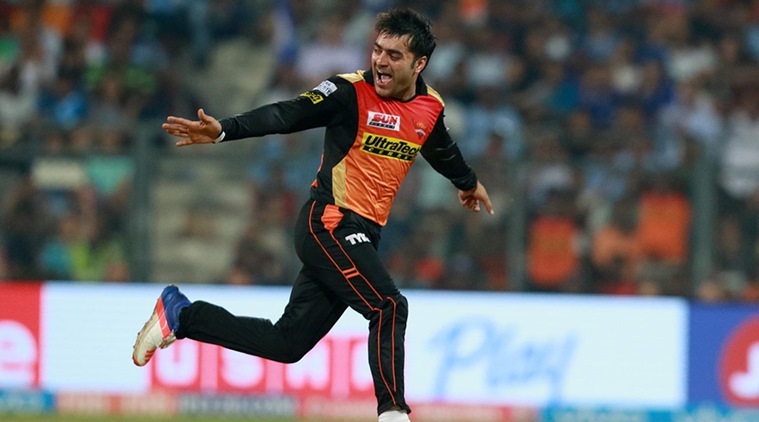 A bowler who is not afraid to challenge batsmen and looks curious to topple them over from thrones of admiration- the world has in Rashid Khan- an unstoppable force. And that said, it remains to be seen which batsman can dominate him? The bowler with the bandana who seemed in a mood for upsetting batsmen every now and then, it was rather pleasing to see another bowler from SRH camp making the right noises with the ball in the IPL. You weren’t really surprised by the title of the best bowling unit went to SRH. Clinching a fantastic 21 wickets from the tournament, Kaul focused on the middle and off line and somehow found a way to stick by it, game after game and contest after contest. In the contest against Rajasthan earlier, where he clinched a 2 for 23, Kaul was able to remove the danger-man Sanju Samson which really hurt in a run chase that wasn’t that stiff a challenge to tackle. And interestingly, Kaul found a way to come up with wickets toward the death overs as well. One of the rare feats of a bowler is when he consistently balls flat out, hits the deck hard and on deliveries where a greatly timed shot on a fuller delivery could’ve fetched easy runs, result in the ouster of a batsman. In a lighter vein, not a bowler who ran after the dominant trend of this IPL- that of bowling the knuckleball- Yadav believed in bowling fuller and toward the stumps not even trying incessantly hard to generate lateral movement away from the batsman. In the game against an unprepared Punjab, that didn’t quite speculate what was coming their way, Yadav clinched a mesmerizing 3-23 and inflicted blows at the top order. First, he enforced a rare failure from Rahul, whose rhythm he upset by taking a yard or two off the ball and later removed a Gayle who seemed set for causing some mayhem. In a tournament where there wasn’t much for RCB to contend with, Yadav was clearly their Numero Uno star, clinching 20 wickets. It’s interesting to note when can one see Kaul in Indian colours. Not a great tournament for Pandya with the bat, who could, at best, play a couple of interesting cameos, Pandya rewarded the faith of Mumbai Indians by consistently featuring among the wickets. Interestingly, one of the better fielders of his own bowling, Pandya- a talent gifted with a natural knack of picking wickets- collected impressive wickets preferring to bowl shorter. For most bowlers, bowling short is tantamount to a risk. For Pandya- it was a natural weapon of choice. He finished with 18 wickets and was also athletic in the field. Interesting to see what the cricket season lying ahead can unveil from this talented all-rounder. PreviousWhy England batsmen are failing to score continuously in Test Cricket?